Zuca was a pregnant stray when she was taken in by an animal welfare agency in Oregon. All her puppies were adopted, and eventually so was Zuca. This sweet pup became best friends with a cat named Stout in her new forever home. 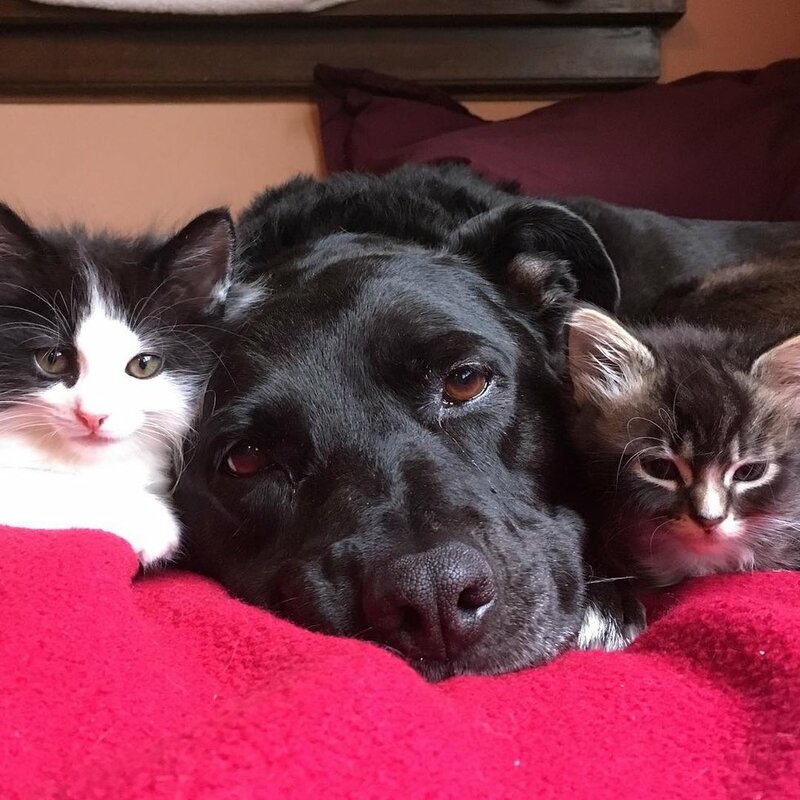 Sadly, Stout passed away and Zuca was depressed…until her human mom Ronda started taking in foster kittens! Zuca has been lovingly caring for nearly 100 foster kittens since 2015. 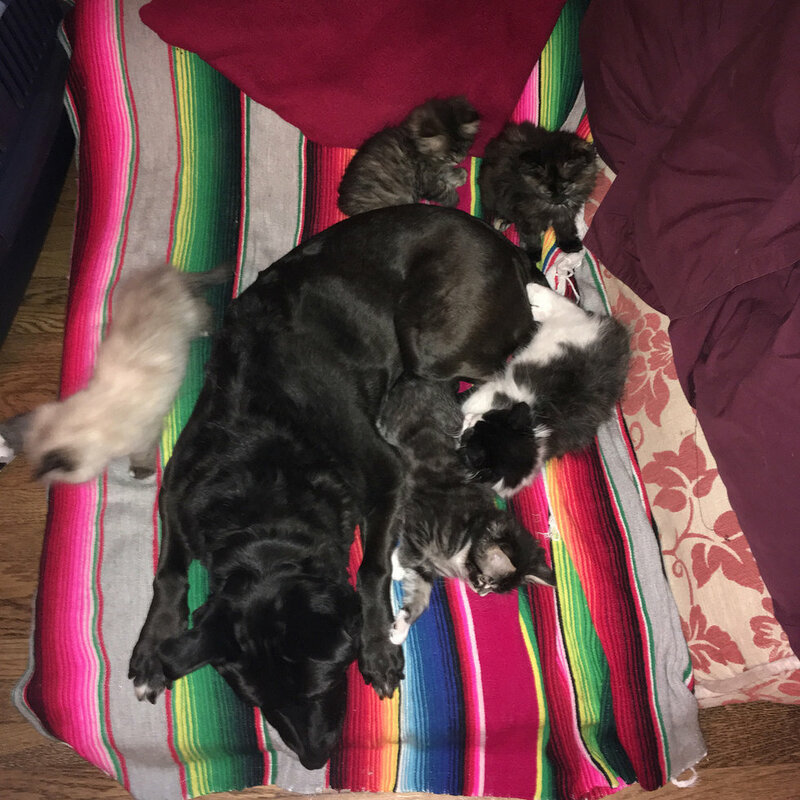 Her mom reports that she gets excited whenever new kittens arrive, and she immediately starts licking them and cuddling with them, knowing instinctively exactly what kind of care each one needs. This upcoming kitten season, Zuca (now 12 years old but still going strong) and her mom hope to foster at least 20 more babies, bringing their total to over 100. An added bonus to all this great mothering from Zuca…. all of her foster babies are very comfortable around dogs and do well in adoptive homes with canine siblings! Check out this adorable video of Zuca in action with her foster kittens, and follow Zuca and her kittens on this irresistible Instagram account! This entry was posted in Cats, Dogs, Pets and tagged animal care, Animal Welfare, Animals, cats, dogs, foster pets, kittens, pet adoption, Pets, rescue, shelter pets, videos by FACE Foundation. Bookmark the permalink. Ah bless her, what a lovely story. That story is beyond precious. What a good dog/cat-mommy Zuca is! What a great story! She is a good mother, Thank you for the video. Here somebody left kittens in a box by a door of a shelter at night. There was a German Shepherd who took care of these kittens. I love this! It’s so funny the cats are always the boss lol Another account you would love is https://www.instagram.com/suzie_and_Kushi/ they are a dog & cat team that foster kittens.